Three condemned criminals, a forger, an uncouth (but efficient) assassin, and a disgraced paladin in possession of a dead demon, are given a second chance. 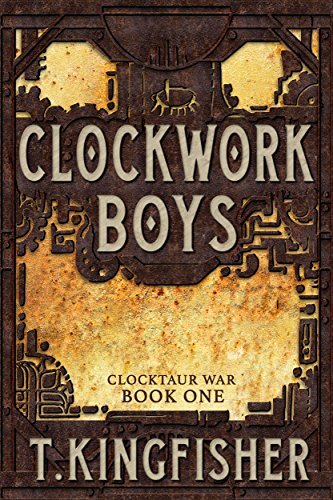 If they can travel to the neighbouring country and find out how the terrifying clockwork boys (deadly manufactured beings, more siege engine than creature) are made and how to stop them, they'll get a pardon. It's not much of a chance. They all think it's going to be a suicide mission. They are joined on their journey by a scholar, all innocence and preconceived ideas. This is a quest tale. Four disparate individuals forming some kind of team, but what lifts it well above average is the characterisation and dialogue. Bleakly funny and heartbreaking by turns, I raced through this and immediately bought the second book, The Wonder Engine, because this is a story of two halves. This book deals with the journey, and now i need to know what happens when they arrive. 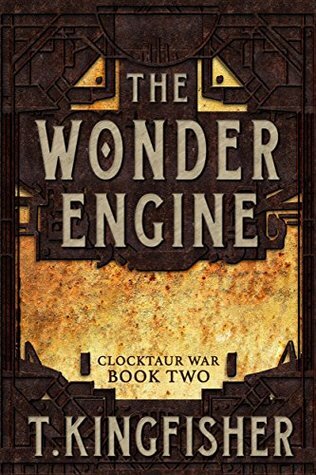 The Wonder Engine follows on immediately from the Clockwork Boys continuing the quest of Slate, Caliban. Brenner and the Learned Edmund who finally arrive in Anuket City to try to discover what the Cloktaurs (Clockwork Boys) are and how they can be stopped. Slate is a guerilla forger, Caliban a disgraced paladin/demon killer, Brenner is simply a killer, a ruthless assassin, and Learned Edmund is a nineteen year old scholar with no experience of the real world. The two books are simply one continuous story. In the first book they were given their task and in the second they have to carry it out. There's a new character, Grimehug, a gnole (a badger-like being) who is crucial to the end game. No spoilers. Just read the pair of books for yourself. You'll thank me for that advice. The characterisation is smart, the dialogue snappy, the internal monologues of each viewpoint character, crisp and revealing. I said the first book was alternately funny and heartbreaking and this goes double for the second one. If not laugh out loud, the humour is wry and the characters self-deprecating. The final showdown is gut-wrenching and the aftermath shows that there are always consequences to every action. Everyone is changed by events. The romance aspect, a very slow burn in the first book, is more to the fore here, and it works well with the main plot, adding tension. The end is entirely fitting and satisfying in a gruelling way. Highly recommended.